The sky was still dark outside and someone was making a racket from the playpen at the other end of the house. I groaned. This was the first night the puppies woke up before dawn and I hoped they'd go back to sleep. But that was not to be. The crying continued. I knew without getting up that it was Sopa. I got up and checked the clock — 4 a.m. — and discovered that I was right. It was Sopa. I groaned again and started to mix up the morning's formula. 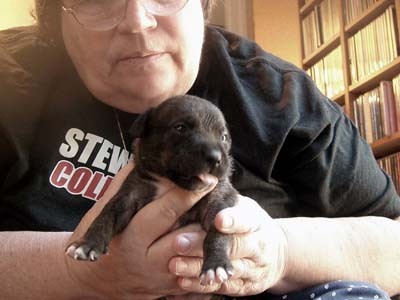 Sopa was significantly smaller than his two siblings when the puppies arrived. He's been steadily catching up since he's been here. He is always the first one to demand food, sometimes the only one to demand food, so he manages to get one or two meals a day more than the others do. His thin frame has rapidly filled out to where he is now as roly poly as the other two and he's beginning to catch up in length as well. Even after all this time, it continues to amaze me how puppies can grow and mature between feedings. How fast they grow from barely mobile lumps to active little puppies. The last couple of batches of puppies we've had came to us only a day or two old. Their eyes were closed, their ears were closed, and they barely moved. These guys were already about 2 weeks old, with opened eyes (at least 2 of them) and starting to move about, so it seems that their "maturing" has positively exploded because we didn't have the week of "blob-dom" that we've had in the past. Still, it seems like it's been overnight. I put one of the puppies down on the kitchen floor yesterday for a second so I could warm the formula and when I turned around, the puppy had waddled into the laundry room and was climbing up the pile of stuff next to the dryer and might have disappeared behind the dryer. It only took an instant. All of the other puppies we've had began tentative playing at about this age and it usually started with batting each other with paws they were just learning to control. 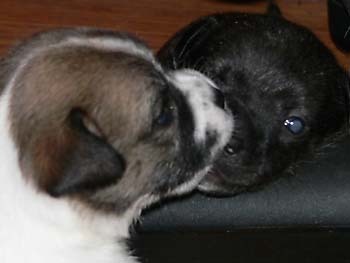 This is the first batch of puppies whose learning to play begins with the mouth wrestling that dogs love to do. Goro and Tattoo sat in the playpen locked in what looked like a lengthy doggie French kiss yesterday. The group has been restless today. Not really hungry, but wanting something and I couldn't figure out what it was. I finally let them out on the family room floor and what fun that was. They don't really have their "land legs" yet. Some are better than others. Tattoo is the best; Goro is the worst. He sometimes can figure out how to walk, but other times he just can't get his legs to stand up under him when he stands on the slippery Pergo (I love the video of the day). The nice thing about letting them walk around on the floor is that it wears them out and then they sleep for a long time. Goro really didn't want to sleep in the playpen, though, but as soon as I put him on the floor, he went to sleep immediately. I wonder if, in the hot weather, it was too warm for him in the playpen and he was enjoying the cool of the Pergo. This isn't really a cuddly group. They are very strong (relative to their size) and squirm and squirm and squirm when you try to cuddle them. When they finish eating, they don't want to just lie in my lap, usually because they have to poop...NOW. Before they eat, if you hold them, they are everywhere at once, sniffing, licking and sucking frantically, as if they hadn't eaten in days. 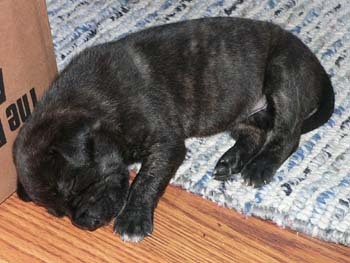 The last puppies were so laid back, that it's an adjustment getting back to pit bull mixes again! It's always a learning process. Each new batch of puppies has its own quirk, its own way of doing things, its own likes and dislikes. There are a lot of similarities, but I've been doing this long enough now that I can see that each batch is unique unto itself, which is what makes it all fun, of course. Sopa after yet another meal.